Winter begins with the longest and darkest night of the year. The Sun moves so slowly that it appears not to be moving at all, hence called the Winter Solstice. This year, it falls on Sunday, December 21st in the Northern Hemisphere. (It was June 21st in the Southern Hemisphere.) This is also the coldest night of the year. Since ancient times, Persians, Afghanis and Kurds alike have been celebrating this remarkable event called Shab eh Yalda by gathering around a korsi – a low, table draped with a heavy blanket, heated with a tray of coals underneath. More modern versions use an electric heater bolted under the tabletop. Friends and family gather around the korsi, sitting on cushions on the floor, all snoodled up with their feet under the tablecloth. Although Armenian, a big part of my heart belongs to the brief childhood I spent in Iran. My mom recalls fond memories of staying up all night with family and friends, munching on fruit and nuts (ajeel), sipping tea, telling stories, singing songs. I was too young when we left for America to remember any of that. So my Persian foodie friends and I decided to revive this lovely tradition this year. Each of us has prepared a special recipe so you can join us. If you are going to be up til the wee hours of the longest night of the year, you are going to need some goodies to munch on. To mark the occasion, I chose Mini Pomegranate-Pistachio Meatballs, my favourite recipe from acclaimed Persian food authority Najmieh Batmanglij. Drawing inspiration from poems and historical accounts, Khanoom Najmieh’s recipes carry with them a romantic message from the past. Among my massive collection of cookbooks are prized copies of her beautiful work From Persia to Napa: Wine at the Persian Table (2006) and Food of Life: Ancient Persian and Modern Iranian Cooking and Ceremonies (2011). Over the years, I have given both as gifts to so many friends and family members that I have lost track of who already has which! Just in time to celebrate Shab eh Yalda, the charming author graciously granted me an interview and shared some heartwarming facts about herself. of your recipes. The most interesting so far were the pistachio-pomegranate meatballs. My mom suggested serving them in as appetizers and they were a hit! but, to my surprise, when I was in Kerman last summer interviewing a local Kermani cook, she made me a delicious fesenjun using pistachios instead of walnuts, and with inside it she had large pistachio and lamb meatballs. Coco: Did you always want a career in cuisine? Najmieh: Yes, I’ve always loved to cook but my mother would not allow me in her kitchen. She would say Go to university. You’ll have plenty of time to cook later in life. So after 7 years in college in the US, I returned home and handed my master’s degree to my mother and she allowed me in her kitchen. Coco: Who taught you to cook? Coco: Where do you draw inspiration for your cooking? Najmieh: Persian literature and historical travelogues about Iran, as well as local, regional Iranian cooks both inside and outside the country. Coco: Do you children share your passion for food? Najmieh: Yes, especially my youngest son, who loves to cook. Coco: Why do you think Persian cooking is not as popular as it should be? Najmieh: In recent history the best of Iranian cooking has been home cooking (and in years past, royal court cooking). Restaurant food in Iran has always been the equivalent of fast food–chelow kabab, kaleh pacheh and dizzy for example–feeding large numbers of people in bazaars and caravansaries. In the past 30 years, most of the Iranians who have started restaurants outside the country have not come from the food business. As a result, the real glory of Persian food has rarely been presented from the point of view of a foodie to the world outside of Iranians’ homes. All those who have had Persian food at Iranian homes have loved it. Coco: Do you feel pressured to always turn out a good meal because you do this professionally? Najmieh: Yes and no. I do feel that I have to serve good food and present it well, but more because that’s what I have always felt. My mother, too. For most Iranians, when someone comes to your house, you want them to get a good impression and be served the best of what you have. However, I have been cooking in the kitchen for last 35 years non-stop. I cook effortlessly. I am good! Ha ha ha! Coco: What are some of your favorites that others make for you? Najmieh: I love good fresh bread, goat cheese, walnuts and Persian basil. Coco: What twists did you add to traditional dishes or those you learned from your mom? Najmieh: For my first cookbook, “Food of Life” I tried to present Persian dishes in a way that was authentic and yet that showed their deliciousness, but, for example, for khoresh-e fesnjan, rather than showing a bowl of brown sauce, which is very un-appetizing, I just added few fresh pomegranate arils and a few toasted walnuts on top of the khoresh. So, in this way, the viewer could visualize the taste. Coco: What’s the secret to making Persian dishes so delicious? Najmieh: Caramelized onions. Every cook should have a glass container of caramelized onion in their kitchen, and of course fresh, seasonal, high quality ingredients. Coco: Do you like chocolate? What is your favourite? Najmieh: I like dark chocolate, a tad salty, a tad minty. Coco: What’s your guilty indulgence? Coco: Are you a shoe or a handbag girl? Najmieh: More a shoe girl. Khanoom Najmieh has a beautiful site with details about her cooking classes and culinary tours. She also contributes mouthwatering recipes to American Pistachio Growers and Epicurious among others. 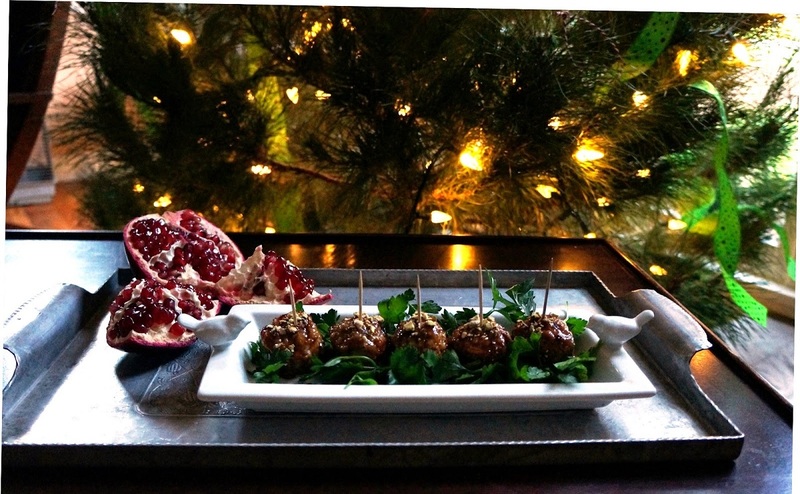 The shimmering holiday season is upon us and cocktail parties are favoured as they are less formal than dinner parties, allow for plenty of social jibber-jabber and delicious finger foods, the best of which are meatballs. No one can resist them, especially those made with pistachios and fresh herbs, baked with a glistening sweet-tart pomegranate glaze. Lucky for us, Mrs. Batmanglij is happy to share her easy and elegant recipe. Notes: The only changes I made to the recipe below are making smaller meatballs. To make the meatballs: Pulse all the ingredients, except the meat and egg, in a food processor until you have a grainy paste. Transfer to a large mixing bowl and add the meat and egg. Lightly knead with your hands for a few minutes (do not overmix). Cover and place in the refrigerator for 30 minutes and up to 24 hours. Preheat the oven to 500˚F. Generously oil a wide, nonreactive baking dish (wide enough to fit 24 meatballs, about 12×14 inches) and set aside. Remove the paste from the refrigerator and shape into bite-sized balls (about 1 1/2 tablespoons each, you can use an ice cream scoop) and place the meatballs in the baking dish and brush well with oil. Bake in the oven for 10 minutes. Meanwhile, in a mixing bowl combine all the ingredients for the glaze. It is important that you taste the glaze and be sure that it has a good balance between sweet and sour—add more honey if the pomegranate molasses you have used is too sour. Reduce the oven to 400˚F. Glaze the meatballs and bake for another 5 minutes to infuse them with the flavor of the pomegranate. Adjust seasoning to taste. If too sour add more honey; if too sweet add more pomegranate molasses. Keep warm in the oven until ready to serve. Place the meatballs with its sauce in deep serving dish and garnish. yum! these look so delicious, and i love how Najmieh ties them to traditional recipes. Definitely one to try. This is awesome!!! I have learned a bit about the world, someone's passions, seen some fine art 🙂 and gotten a totally awesome recipe. You remain an inspiration! Greg, this is a delicious start! She keeps Persian heritage alive with her cooking. Chippy, you should try make these with TVP (Textured Vegetable Protein) or maybe crumbled firm tofu?? Let me know. This sounds so unique! And the pomegranates are making it festive 🙂 I love it! Hi Coco, I love everything about your post. Great story, great interview, great recipe and great photography. I love your drawing of the korsi! Thank you for including us in your post too! xoxo Fae. Lovely interview and very yummy looking meatballs. I can't wait to try. Thanks so much for sharing!